AIM: To determine the nurse educators' experiences in implementing EBP in teaching and learning, and to describe the importance and benefits of EBP teaching and learning to the nursing profession, especially for nurse educators and student nurses. Evidenced-based practice (EBP) is described by Melnyk et al. (2012:410) as a problem-solving approach to clinical decision-making in health care. Evidence-based practice integrates the best evidence from well-designed studies with the clinicians' expertise, including internal evidence from patient assessments and practice data, and patients' preferences and values. Melnyk et al. (2012:410) further revealed that implementation of EBP leads to a higher quality of care, improved patient outcomes, and decreased health care costs. Nurse educators play a key role in creation of opportunities for implementing EBP and in facilitating the implementation process. The question now is how to foster implementation of EBP. The most important factor that is likely to help nurses and nurse educators to adopt EBP is the provision of adequate training in EBP (Heikkila et al. 2017:3). The importance of embedding EBP in nurse education programmes cannot be underestimated if EBP and its positive patient outcomes are to be realised in health care settings. According to Felicilda-Reynaldo and Utley (2015:93), one nurse educator noted that 'nurse graduates will be prepared to facilitate a transformation of the health care system culture by implementing practice review and revision consistent with evidence-based nursing (EBN) research'. The above-mentioned statement highlights the importance of incorporating EBP throughout the curriculum to prepare students for future success in using EBP in their professional nursing practice (Felicilda-Reynaldo & Utley 2015:93). Mackey and Bassendowski (2016:54) indicated that utilising nursing best practice guidelines, reviewing and implementing applicable research evidence, and taking advantage of technological advances are ways in which nursing can move forward as a well-informed discipline. Malik, McKenna and Griffiths (2015a:158) in Australia reported that integrating EBP into undergraduate nursing education and preparing future nurses to embrace EBP into clinical practice becomes crucial in today's complex and evolving health care environment. The study further implies that the role that EBP plays in the practical lives of student nurses will depend on the degree to which it is promoted by academics; the extent to which it is incorporated in course objectives, content and assessments; and its application within the clinical setting (Malik et al. 2015a:158). In this way, nurses' willingness to carry out research projects, as well as to utilise the research findings effectively in practice is enhanced. Data were collected in June 2017 using semi-structured interviews, interview guide and the digital voice recorder. To ensure anonymity, code numbers were allocated to each participant. The researcher kept all collected and private information shared safely locked and/or encrypted in the researchers' computer for 5 years. Participants were informed of the presence of the research assistant during the interview process and all participants granted the researcher permission to record interviews. Semi-structured individual interviews were conducted using the self-developed interview guide and digital voice recorder as data-collection instruments. The interview guide was developed in English based on the research purpose, research objectives, research questions and literature review. It comprised predetermined open-ended questions to get in-depth information about participants' experiences and was pre-tested before conducting the main study to determine the feasibility of the instrument. All interviews were captured on the digital voice recorder with the help of the research assistant who had training in doing qualitative interviews prior to data collection. Strategies employed to ensure the quality of data included the following measures of trustworthiness as suggested by Lincoln and Guba's framework (Polit & Beck 2017:560). Credibility: Data were collected through face-to-face interviews, directly from the participants using a digital voice recorder and they were given a chance to confirm data before the final written report. Participants were provided with the opportunity to review the researchers' interpretation of data. Participants were from three race groups: African, Indian and Coloured.1 They were all women. Their years of experience ranged between 5 and 30 years, occupying the ranks of junior nurse educator, senior nurse educator and Head of Department. The highest qualifications were a Bachelor's, Honour's or Master's degree in Health and Nursing Science Studies as indicated in Table 1. The findings revealed that nurse educators are experiencing certain challenges with the implementation of EBP in teaching and learning. They include time constraints, lack of and poor access to relevant resources, the use of traditional teaching approaches which are still dominant, nurse educators' lack of or poor knowledge and skills, and the quality of nursing students. Emmanuel et al. (2011:22) in their study on developing EBP among student nurses in the United Kingdom identified similar challenges that prevented the nurses from successfully using EBP, which included poor access to facilities and information, lack of experience and little confidence in using computers. Schoonees, Rohwer and Young (2017:11) reported that the challenges experienced by lecturers at a sub-Saharan African academic institution were a lack of time by the programme to dedicate to evidence-based health care, lack of evidence related to a specific field, lack of student motivation and the students' schooling background. Insufficient financial resources as well as journals, reports and computers for making EBP a reality in theoretical and clinical teaching could affect negatively the nurse educators' ability to access evidence from various sources. It has been discovered that when nurses are provided with the necessary tools such as smart phones and computers inter alia, they are much more likely to access relevant information and best practice guidelines (Mackey & Bassendowski 2016:53). In an Australian study on integration of EBP into the curriculum, Malik et al. (2015a:158) mention that there is lack of clarity on EBP content and process. Clarity is frequently blurred with research processes and outcomes, which often results in continuation of traditional nursing research courses in the hope of preparing EBP practitioners. Leufer and Clearly-Holdforth (2015:11) state that if optimal patient outcomes are to be maximised, practitioners' skills and knowledge base must be fostered and enhanced through ongoing education, training and support. 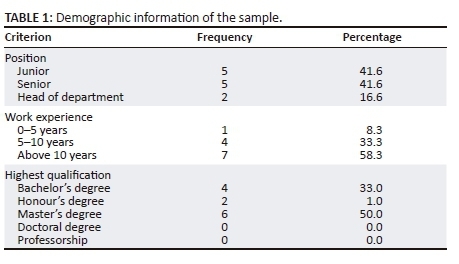 Nurse educators had a challenge with students' attitude and perceptions towards EBP, and their lack of computer skills. According to participants, students appear to have preconceived ideas about research in general. These perceptions are negative and overwhelming for students. A negative attitude develops among the student nurses, because students do not understand the importance of EBP. Nurse educators felt that students' lack of confidence, motivation, and commitment to perform and use research contributed to misperception and their resultant negative attitude. The nursing programme R425 is perceived as being full, overwhelming, with competing priorities of research, clinical, and theoretical workloads. Students' attitudes and perceptions can influence EBP learning either positively or negatively. Should students' roles be clearly defined early during training, so that they understand the importance of EBP, a positive attitude develops within them. According to Malik et al. (2015a:158), the role that is played by EBP in the practical lives of nursing students depends on the degree to which it is promoted by academics, the extent to which it is incorporated into course objectives, content and assessments; and its application to clinical practice. Nurse educators displayed a positive attitude and appeared to be very supportive of EBP teaching and learning. Reinforcing this statement, Mehrdad et al. (2012:507) reported that nurses' knowledge and attitude towards EBP contribute to its implementation in health care. Therefore, nurse educators and nursing students need to keep up to date with current evidence for use in practice. Current practices relied on by senior nurses and nurse educators are frequently based on personal experience, tradition, intuition, and organisational policies or protocols, rather than on evidence (Malik et al. 2015b:47). 1 . The author understands and acknowledges the sensitivity of the terms used and prefers to use as classified according to the Republic of South Africa's Government Application Form for Employment in order to avoid misinterpretation of the study results.